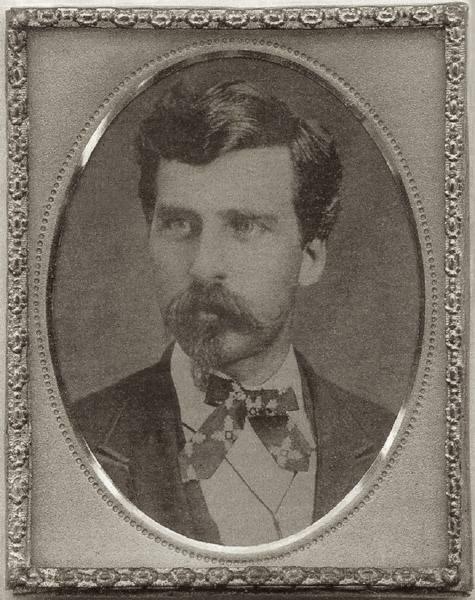 George William Cook was born circa March 1849 in Alabama. Andrew Jackson Cook and Sarah Juliet Evelina Mitchell appeared in the US federal census of 1 June 1850 in Coosa County, Alabama. Other members of the household included George William Cook, Thomas Mitchell Cook, Francis Billing Cook and Conrad Evelyn Cook. Also in the household was teacher David Williams, age 27. Sarah Juliet Evelina Mitchell appeared in the US federal census of 1 June 1860 in Montgomery County, Alabama. Other members of the household included George William Cook, Thomas Mitchell Cook, Francis Billing Cook, Conrad Evelyn Cook, Eason Thweatt Cook, Mary Wood Cook, Caroline Catherine Cook and Sarah Juliet Cook. Sarah Juliet Evelina Mitchell Cook wrote on 12 June 1864, in a letter to her son Conrad Evelyn Cook, "Frank and Georgie caught some fish at the river for our dinner. The ones we caught in the creek were too small. "Mary" caught the largest one that day. "Easie" the greatest number - he is so quiet & steady - never plays like the others." George William Cook appeared in the US federal census of 1 June 1870 in Montgomery, Alabama, apparently in a boarding house with other bookkeepers and store clerks. He was a clerk in a store, according to the 1870 census. He married Elvira A. Dawson on 20 May 1879 in Muscogee County, Georgia, by license issue the 19th, with Joseph S. Key, MG, officiating. George William Cook appeared in the US federal census of 1 June 1900 in Montgomery, Alabama, at 315 Madison Avenue enumerated at the same address as Virginia Gordon Abercrombie and her grandchildren.. Other members of the household included Hugh Dawson Cook. The record identifies George as a widower. He was a merchandise broker, according to the 1900 census. The following appeared on 1 September 1909 in The Montgomery Advertiser: FOR RENT--A Store room and dwelling at Seeigner, Ala. Extra land to be had if wanted. Apply Geo. W. Cook, Montgomery, Al. The following appeared on 10 October 1915 in The Montgomery Advertiser: WANTED--Or rather, if you want your cheeks to wear nature's bloom which is always the insignia of a healthy and vigorous body, drink Copiously of the Natural Blue Lick Water to be had of the leading druggists and founts. Geo. W. Cook, Distributor, 115 Coosa St. The following appeared on 8 September 1918 in The Montgomery Advertiser: SPEEDOLINE--If all users of gasoline would use Speedoline and save 25 to 40 per cent of gasoline there would soon be no necessity for further conservation. Besides it removes carbon and prevents its further formation, thereby eliminating 75 per cent of your auto trouble. Geo. W. Cook, Agent, 115 Coosa St., Phone 140. The following appeared on 27 December 1919 in The Montgomery Advertiser: The friends of George W. Cook, well known Montgomerian, will regret to learn he is confined to his room at the Melrose Hotel, suffering from a sprained ankle. His many friends wish for him a speedy recovery. The following appeared on 1 January 1920 in The Montgomery Advertiser: While there were a higher number of failures in Montgomery proper during 1919 than during 1918, there were far less in the 23 counties hereabouts that are looked after by Bradstreet's agency. That agency states, too, that the total failures in the United States were much less in 1919 than in 1918, and less than for each of the years for some time tack of 1918. There has been quite an increase in the number of new merchants in the Montgomery territory, and generally so all over the country, the local manager of Bradstreet says. The most significant statement he makes relative to Montgomery business firms is that a number of them have made collections during the past year that had already been charged off to "profit and loss." Failures at Montgomery in 1918 were as follows: . . . June--George W. Cook. Assets, $1,050; liabilities, $2,351. . . The following appeared on 27 January 1920 in The Montgomery Advertiser: Mr. Frank D. Cook died at his residence at Pike Road Monday evening at 7 o'clock following a brief illness. He was 77 years old and is survived by three sisters, Mrs. Mary W. Blue of Montgomery, Mrs. H. R. Adams of Birmingham and Mrs. T. W. Graff of Robinson Springs and one brother, George W. Cook of Montgomery. Funeral services will take place from the Leak-McCarty chapel Tuesday afternoon at 3:30 o'clock and interment will follow at Oakwood. The following appeared on 6 May 1920 in The Montgomery Advertiser: FOR SALE--8,000 ft 1x4 kiln dried lumber at a bargain if taken quick. Geo. W. Cook. Phone 144. P. O. Box 147. The following appeared on 3 April 1921 in The Montgomery Advertiser: COTTON SEED if it is the best and earliest maturing, the kind of beat the boll weevil you want and most reasonable price. See me before supply is exhausted. Geo. W. Cook, P. O. Box 147 Phone 144. The following appeared on 30 January 1922 in The Montgomery Advertiser: COAL--Notwithstanding the coldest weather is in front of us, I am authorized to offer you for immediate shipment, best all lump white ash at $8, red ash at $9 delivered. Register your order at once with George W. Cook. Phone 143. At the time of his death George William Cook was living in Montgomery, Alabama, at 420 Alabama Street. George William Cook died on 3 May 1926 in Montgomery, Alabama.